I am just a little bit excited to show you my new bag. Last year at Fat Quarterly Retreat I took a paper piecing class taught by Joanna and Julianna which I wrote about here (free pattern available here). It has hung rather beautifully ever since on the wall of my sewing space; patiently waiting. In January this year a local lady came round to pick up some fabric she had purchased from me and suggested that I used the block on a bag. That suggestion stayed with me. I’ve had Noodlehead’s Supertote pattern for a while now and a few weeks ago decided it was time to tackle it. So I read the pattern through a couple of times, read others people’s reviews and modifications of the patterns and set about thinking what to do with mine. 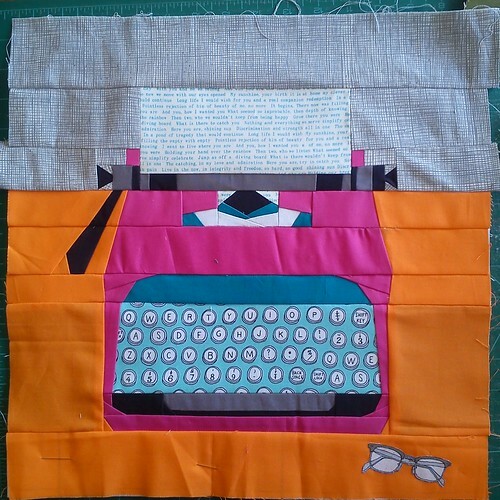 Laying the pattern piece for the exterior pocket on my typewriter block I was delighted to discover that it was the perfect size for it (I had to remove the glasses as they would be caught up in the seam allowance). I opted for recycling a pair of jeans from the charity shop for the main panels and gusset as I wanted something hard wearing and that would contrast well with the typewriter. I was struggling slightly with the amount of denim I had to work with (approximately one and half legs!) 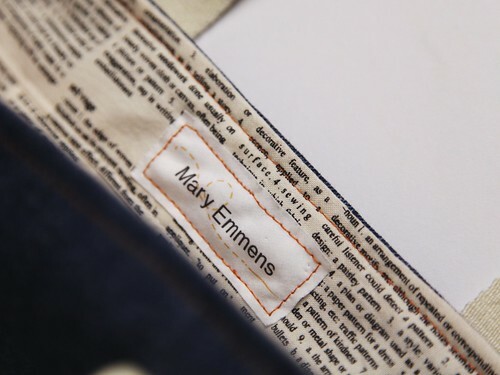 and creatively cut up one of the seam lines and used the uncut seam as the middle of the back piece. 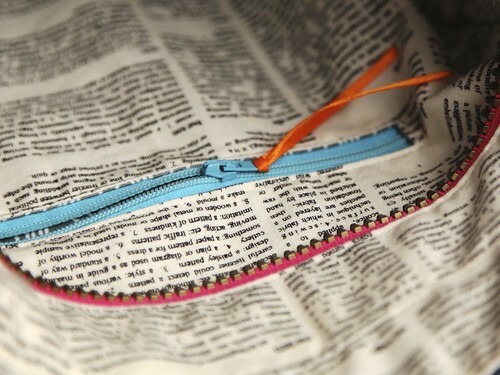 The changes I made were to add an internal zip pocket on one side rather than the elasticated pockets. 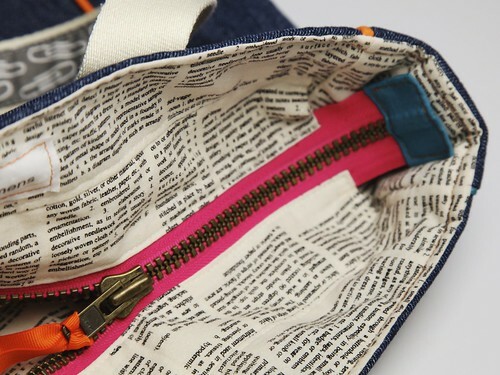 I added piping to the top of the pocket and all around the gusset, it adds a great pop of colour to the dark denim. I used the same orange on the back as I used in the typewriter block. You can see some of the detail on the top stitching in Aurifil 40W 2150 a dark orange which again just adds some lovely detail. For the straps I used webbing and top stitched the paper clip print (Type by Julia Rothman) on to it, in keeping with the desk/office theme! It’s a great pattern, lots of preparation work to do before you start sewing but it’s worth it. 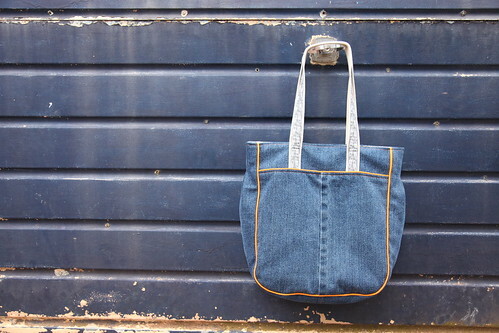 Not only do I love it but Tobit has declared it’s his favourite bag that I’ve made too! It’s fab Mary! Despite my frustrations with how mine turned out, I’ve used it all summer, which must be a good sign! I may have to make a winter version. Your Supertote is wonderful! 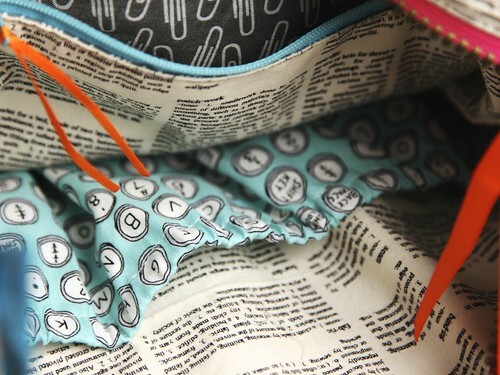 I love how you match the details on the tote with the colors used on the typewriter block! Absolutely beautiful! 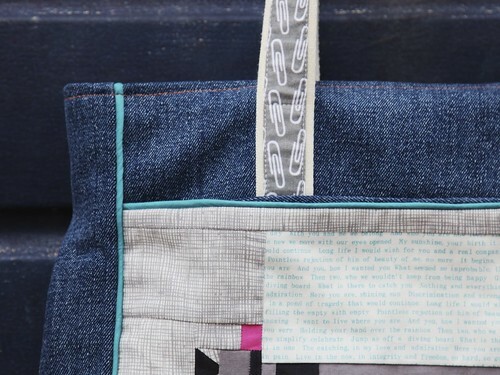 Love the block as a focal point, the denim is perfect for the back. Your innards are so pretty, too! 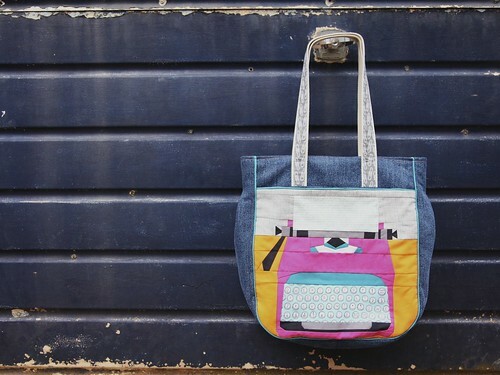 I’m still scared of this pattern – love the bags I see, but it freaks me out to no end. It is brilliant!!! 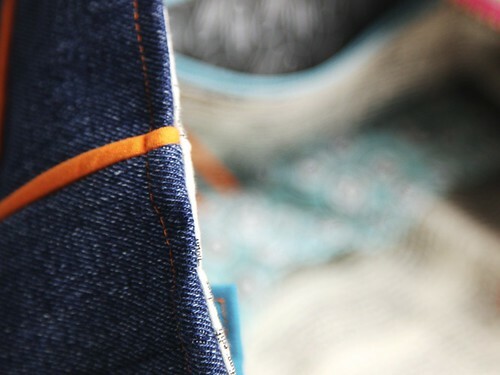 So different and I love the insides and the denim (and your denim quantities)!! Mary, your tote is fabulous! The details are perfect. I’ve shared your post on my FB as a great inspiration for others, hope you don’t have anything against. What a fab bag. I love all the detailing. I thought the supertote would be too big for me as I’m quite small but having made one last summer it was the bag I used the most on holiday. It’s fun to reduce the pattern and make smaller versions too though. It’s fab Mary! My block is sitting unfinished in a bag somewhere. Good for you ford doing something beautiful with it! Love it Mary, especially all the extra finishing touches.